the SPCA Monteregie / PetitsPawz Fundraiser at the House of Shoes this week! Here are the winners for the 3 Door Prizes I was offering! Prize #1 - Valued at $100 A FREE CLASS for you and 3 Friends....Diane P.
Prize #2 - Valued at $28 a Simply Scrappin' Kit is ... Mary S.
Prize #3 - Valued at $20 is... Lynda S.
I will be contacting you soon to make arrangements for your prize deliveries! coupon in the loot bag for a FREE Introductory Class for you and a friend! I book several per month with a variety of time slots. Book yours today! If its easier if I come to you, just ask! Don't forget about the SALE! Demonstrator Kit is 50% OFF!! I'll be in the Ottawa area today signing up new team members!! Selected Catalogue Items are up to 50% OFF! Email or call me with your orders! Yes you CAN combine sale items with other Stampin' Up! items! Orders over $200 receive FREE SHIPPING plus all the Hostess Benefits!!! This Stampin' Up! special is available across Canada!! I can ship Canada wide! 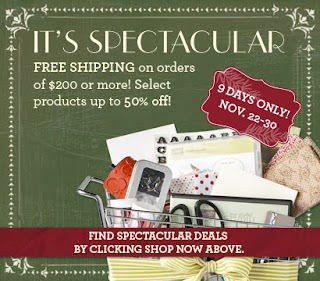 For 9 days only…you'll find some fabulous prices on Stampin' Up! products, bundles and digital downloads! This is an event you don't want to miss! This is Christmas-Shopping-in-your-PJ's at its best! These orders CAN be combined with any other Stampin' Up! Products in any of our current catalogues!! CLICK HERE FOR THE FLYER!!!! which means FREE products just for you!!! Want to view them all now online??? Additional products from current catalogues may be purchased on the same order. In order to receive free shipping, orders must be $200 or more before tax and shipping. Join a few orders with some friends! You will all save !! GET SHOPPING NOW AND PICK UP SOME GREAT DEALS! Happy Shopping! Email or call me with your orders! 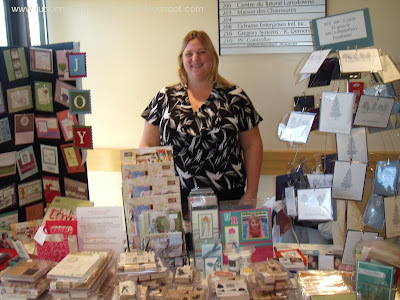 Yes you CAN combine the sale items with any other Stampin' Up! items! I am very proud to be a part of this important fundraiser!! I will have dozens of Christmas cards for sale... taking custom orders also! In addition, I will of course have a variety of new and used stamp sets, ink pads and cardstock for sale! Stop in for the fun...stay and support the cause!